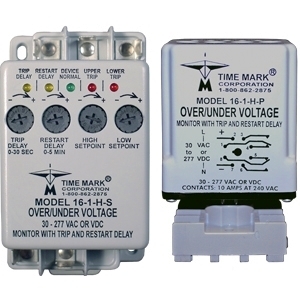 The Model 260 Voltage Sensor is a single set-point voltage sensor. Input voltages above the set-point cause the output contacts to energize (contacts 1 & 8 closed). Input voltages below the set-point cause the output contacts to de-energize (contacts 1 & 2 closed). The dead band between pull-in and drop-out is less than 2%. The standard unit has a screwdriver, or fingertip adjustable set-point range of approximately 35%. of the maximum voltage. This device can also be provided with a factory calibrated trip point. 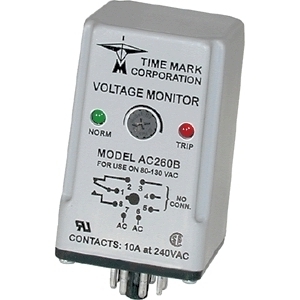 AC versions of the Model 260 Voltage Sensor are not frequency sensitive, and may be used in systems from 50 Hz to 400 Hz. DC models are not polarity sensitive. This device requires a standard 8-pin socket, such as Time Mark’s Model 51×120.